The Chatham Islands form an archipelago in the Pacific Ocean about 800 kilometres (500 mi) east of the South Island of New Zealand. It consists of about ten islands within a 40-kilometre (25 mi) radius, the largest of which are Chatham Island and Pitt Island. Some of these islands, once cleared for farming, are now preserved as nature reserves to conserve some of the unique flora and fauna. The resident population is 600 (as of 2013[update]). The local economy is largely dependent on conservation, tourism, farming, and fishing. The archipelago is called Rēkohu ("Misty Sun") in the indigenous Moriori language, and Wharekauri in Māori. The Moriori are indigenous to the Chatham Islands, having arrived around 1500 and developed a peaceful way of life. In 1835, the Ngāti Mutunga and Ngāti Tama tribes invaded the island and nearly exterminated the Moriori, enslaving the survivors. The Chatham Islands have officially been part of New Zealand since 1842, and in 1863, the Moriori were released from slavery. The Chatham Islands include New Zealands's easternmost point, the Forty-Fours. Local administration is provided by the Chatham Islands Council, whose powers are similar to other unitary authorities. The islands constitutionally make up part of the New Zealand Outlying Islands, meaning they are an immediate part of New Zealand, but do not belong to any region or district. Instead, they form an Area Outside Territorial Authority, like all other outlying islands apart from the Solander Islands. The islands sit on the Chatham Rise, a large, relatively shallowly submerged (no more than 1,000 metres or 3,281 feet deep at any point) part of the Zealandia continent that stretches east from near the South Island. 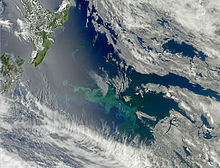 The Chatham Islands, which emerged only within the last four million years, are the only part of the Chatham Rise showing above sea level. The islands are hilly with coasts being a varied mixture including cliffs and dunes, beaches, and lagoons. Pitt is more rugged than Chatham, although the highest point (299 metres or 981 feet) is on a plateau near the southernmost point of the main island (at 44°07′12″S 176°34′38″W﻿ / ﻿44.12000°S 176.57722°W﻿ / -44.12000; -176.57722, 1.5 kilometres (0.93 mi) south of Lake Te Rangatapu). The plateau is dotted with numerous lakes and lagoons, flowing mainly from the island's nearby second highest point, Maungatere Hill, at 294 metres. Notable are the large Te Whanga Lagoon, and Huro and Rangitahi. Chatham has a number of streams, including Te Awainanga and Tuku. The Fort Mangere Mangere The Māori name has supplanted the English name for this island. 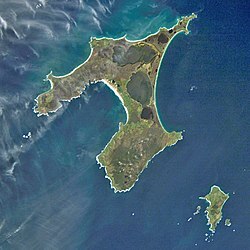 Chatham Islands have an oceanic climate characterised by a narrow temperature range and relatively frequent rainfall. Its isolated position far from any sizeable landmass renders the record temperature for main settlement Waitangi to be just 23.8 °C (74.8 °F). The climate is cool, wet and windy, with average high temperatures between 15 and 20 °C (59 and 68 °F) in summer, and between 5 and 10 °C (41 and 50 °F) in July, the Southern Hemisphere winter. Snow is extremely rare, being recorded near sea level in July 2015 after several decades. The Chatham Islands are part of the, now largely submerged, continent of Zealandia and are the only part of the Chatham Rise above sea level. This places the Chatham Islands far from the Australian-Pacific plate boundary that dominates the rest of New Zealand's geology. The islands' stratigraphy consists of a Mesozoic schist basement, typically covered by marine sedimentary rocks. Both these sequences are intruded by a series of basalt eruptions. Volcanic activlity has occurred multiple times since the Cretaceous, however, there is currently no active volcanism near any part of the Chatham Rise. The natural vegetation of the islands was a mixture of forest, scrubby heath, and swamp, but today most of the land is fern or pasture-covered, although there are some areas of dense forest and areas of peat bogs and other habitats. Of interest are the akeake trees, with branches trailing almost horizontally in the lee of the wind. The ferns in the forest understory include Blechnum discolor. For accounts and notes on seabird species seen in the Chathams between 1960 and 1993 online. A number of species have gone extinct since human settlement, including the three endemic species of rails, the Chatham raven, and the Chatham fernbird. Also, a number of marine mammals are found in the waters of the Chathams, including New Zealand sea lions, leopard seals, and southern elephant seals. Many whale species are attracted to the rich food sources of the Chatham Rise. On 19 November and 5 December 1835, about 900 Ngāti Mutunga and Ngāti Tama previously resident in Te Whanganui-A-Tara (Wellington) and led by the chief Matioro arrived on the brig Lord Rodney. The first mate of the ship had been 'kidnapped and threatened with death' unless the captain took the Māori settlers on board. The group, which included men, women and children, brought with them 78 tonnes of seed potato, 20 pigs and seven large canoes called waka. The incoming Māori were received and initially cared for by the local Moriori. Soon, Ngāti Mutunga and Ngāti Tama began to takahi, or walk the land, to lay claim to it. When it became clear that the visitors intended to stay, the Moriori withdrew to their marae at te Awapatiki. There, after holding a hui (consultation) to debate what to do about the Māori settlers, the Moriori decided to keep with their policy of non-aggression. Ngāti Mutunga and Ngāti Tama in turn saw the meeting as a precursor to warfare on the part of Moriori and responded. The Māori attacked and in the ensuing action killed over 260 Moriori. A Moriori survivor recalled: "[The Māori] commenced to kill us like sheep... [We] were terrified, fled to the bush, concealed ourselves in holes underground, and in any place to escape our enemies. It was of no avail; we were discovered and killed — men, women and children — indiscriminately." A Māori chief, Te Rakatau Katihe, said: "We took possession ... in accordance with our custom, and we caught all the people. Not one escaped. Some ran away from us, these we killed; and others also we killed — but what of that? It was in accordance with our custom." Despite the Chatham Islands being made part of New Zealand in 1842, Māori kept Moriori slaves until 1863. After the killings, Moriori were forbidden to marry Moriori, or to have children with each other. All became slaves of the Māori until the 1860s. Many died in despair. Many Moriori women had children by their Māori masters. A number of Moriori women eventually married either Māori or European men. Some were taken away from the Chathams and never returned. Ernst Dieffenbach, who visited the Chathams on a New Zealand Company ship in 1840, reported that the Moriori were the virtual slaves of Māori and were severely mistreated, with death being a blessing. By the time the slaves were released in 1862, only 160 remained, hardly 10% of the 1835 population. In early May 1838 (some reports say 1839 but this is contradicted by ship records) the French whaling vessel Jean Bart anchored off Waitangi to trade with the Māori. The number of Māori boarding frightened the French, escalating into a confrontation in which the French crew were killed and the Jean Bart was run aground at Ocean Bay, to be ransacked and burned by Ngāti Mutunga. When word of the incident reached the French naval corvette Heroine in the Bay of Islands in September 1838, it set sail for the Chathams, accompanied by the whalers Adele and Rebecca Sims. The French arrived on 13 October and, after unsuccessfully attempting to entice some Ngāti Tama aboard, proceeded to bombard Waitangi. The next morning about a hundred armed Frenchmen went ashore, burning buildings, destroying waka, and seizing pigs and potatoes. The attacks mostly affected Ngāti Tama, weakening their position relative to Ngāti Mutunga. In 1840, Ngāti Mutunga decided to attack Ngāti Tama at their pa. They built a high staging next to the pa so they could fire down on their former allies. Fighting was still in progress when the New Zealand Company ship Cuba arrived as part of a scheme to buy land for settlement. The Treaty of Waitangi, at that stage, did not apply to the islands. The company negotiated a truce between the two warring tribes. In 1841, the New Zealand Company had proposed to establish a German colony on the Chathams. The proposal was discussed by the directors and John Ward signed an agreement with Karl Sieveking of Hamburg on 12 September 1841. However, when the Colonial Office said that the islands were to be part of the colony of New Zealand and any Germans settling there would be treated as aliens, Joseph Somes claimed that Ward had been acting on his own initiative. The proposed leader John Beit and the expedition went to Nelson instead. The company was then able to purchase large areas of land at Port Hutt (which the Māori called Whangaroa) and Waitangi from Ngāti Mutunga and also large areas of land from Ngāti Tama. This did not stop Ngāti Mutunga from trying to get revenge for the death of one of their chiefs. They were satisfied after they killed the brother of a Ngāti Tama chief. The tribes agreed to an uneasy peace which was finally confirmed in 1842. Reluctant to give up slavery, Matioro and his people chartered a brig in late 1842 and sailed to Auckland Island. While Matioro was surveying the island, two of the chiefs who had accompanied him decided the island was too inhospitable for settlement, and set sail before he had returned, stranding him and his followers until Pākehā settlers arrived in 1849. In 1865, the Māori leader Te Kooti was exiled on the Chatham Islands along with a large group of Māori rebels called the Hauhau, followers of Pai Mārire who had murdered missionaries and fought against government forces mainly on the East Coast of the North Island of New Zealand. The rebel prisoners were paid one shilling a day to work on sheep farms owned by the few European settlers. Sometimes they worked on road and track improvements. They were initially guarded by 26 guards, half of whom were Māori. They lived in whare along with their families. The prisoners helped build a redoubt of stone surrounded by a ditch and wall. Later, they built three stone prison cells. In 1868 Te Kooti and the other prisoners commandeered a schooner and escaped back to the North Island. Almost all the Māori returned to Taranaki in the 1860s, some after a tsunami in 1868. The economy of the Chatham Islands, then dominated by the export of wool, suffered under the international depression of the 1880s, only rebounding with the building of fish freezing plants at the island villages of Ōwenga and Kaingaroa. The wharf at Waitangi was first built around the year 1934. However, with the sinking of the Chatham Islands supply ship during the Second World War in 1940 it saw little use by ships. A flying-boat service was set up soon after the sinking for supplies and transport. This continued till 1966 when it was replaced with conventional aircraft. After the Second World War the island economy suffered again due to its isolation and government subsidies became necessary. This led to many young Chatham Islanders leaving for the mainland. A public radio link to the mainland was built in 1953 and an island phone system in 1962. There was a brief crayfish boom which helped stabilize the economy in the late 1960s and early 1970s. From the early 2000s cattle became a major component of the local economy. The population of the islands is around 600, including members of both ethnic groups. In January 2005, the Moriori celebrated the opening of the new Kopinga Marae (meeting house). Modern descendants of the 1835 Māori conquerors claimed a share in ancestral Māori fishing rights. This claim was granted. Now that the primordial population, the Moriori, have been recognised to be former Māori—over the objections of some of the Ngāti Mutunga—they too share in the ancestral Māori fishing rights. Both groups have been granted fishing quotas. Chatham and Pitt Islands are inhabited, with 600 residents in the 2013 Census. The town of Waitangi is the main settlement with some 200 residents. There are other villages such as Owenga, Te One and Kaingaroa, where there are two primary schools. A third school is on Pitt Island. There are also the fishing villages of Owenga and Port Hutt. According to the 2013 census there were 264 occupied dwellings, 69 unoccupied dwellings, and 3 dwellings under construction. Of the residential population, 315 (52.5%) were male compared to 48.7% nationally, and 285 (47.5%) were female, compared to 51.3% nationally. The archipelago had a median age of 41.5 years, 3.5 years above the national median age of 38.0 years. People aged 65 and over made up 12.0% of the population, compared to 14.3% nationally, and people under 15 years made up 20.0%, compared to 20.4% nationally. The Chatham Islands' ethnicity is made up of (national figures in brackets): 73.5% European (74.0%), 59.3% Māori (14.9%), 1.1% Pacific Islanders (7.4%), 0.5% Asian (11.8%), 0.0% Middle Eastern, Latin American or African (1.2%), and 3.2% other (1.7%). Note that where a person reported more than one ethnic group, they have been counted in each applicable group. As a result, percentages do not add up to 100. The unemployment rate is of 2.5% of people 15 years and over, compared to 7.4% nationally. The median annual income of all people 15 years and over was $31,500, compared to $28,500 nationally. Of those, 31.0% earned under $20,000, compared to 38.2% nationally, while 31.0% earned over $50,000, compared to 26.7% nationally. Visitors to the Chathams generally arrive in the islands via Tuuta Airport. 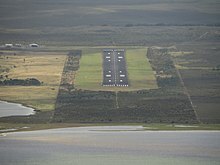 Visitors to the Chathams usually arrive by air from Auckland, Christchurch or Wellington (around 1.5 – 2 hours from Christchurch on a Convair 580) to Tuuta Airport on Chatham Island. While freight generally arrives by ship (2 days sailing time), the sea journey takes too long for many passengers, and is not always available. The ship Rangatira provided a freight service from Timaru to the Chatham Islands from March 2000 to August 2015. The MV Southern Tiare provides a freight service between Napier, Timaru and the Chathams. Until the 1980s, the Chathams were in the Lyttelton electorate, but since then they have formed part of the Rongotai general electorate, which mostly lies in Wellington. Paul Eagle is the MP for Rongotai. The Te Tai Tonga Māori seat (held since 2011 by Rino Tirikatene) includes the Chatham Islands. Local government on the islands, uniquely within New Zealand, involves a council established by its own Act of Parliament, the Chatham Islands Council Act 1995 (Statute No 041, Commenced: 1 November 1995). The Chatham Islands Council operates as a district council with regional council functions, making it in effect a unitary authority but with not quite as many responsibilities as the others. The Council comprises a Mayor and eight Councillors, one of whom is also Deputy Mayor. Certain regional council functions are being administered by Environment Canterbury, the Canterbury Regional Council. Most of the Chatham Island economy is based on fishing and crayfishing, with only a fragment of the economic activity in adventure tourism. This economic mix has been stable for the past 50 years, as little infrastructure or population is present to engage in higher levels of industrial or telecommunications activity. Two 225-kW wind turbines and diesel generators provide power on Chatham island, at costs of five to ten times that of electricity on the main islands of New Zealand. During 2014, 65% of the electricity was generated from diesel generators, the balance from wind. ^ "2013 Census QuickStats about a place: Chatham Islands Territory". Statistics New Zealand. Retrieved 16 December 2017. ^ Davis, Denise; Solomon, Māui. "Moriori - The impact of new arrivals". Te Ara - the Encyclopedia of New Zealand. Retrieved 8 December 2018. ^ McGlone, Matt (21 September 2007). "Ecoregions: The Chatham Islands". Te Ara – the Encyclopedia of New Zealand. Retrieved 8 February 2009. ^ "Chatham Islands Conservation Management Strategy" (PDF). Department of Conservation. p. 32. Retrieved 17 October 2017. ^ "Waitangi, Northland, New Zealand Climate Summary". Weatherbase. Retrieved 11 January 2015. ^ "Waitangi, Northland, New Zealand Temperature Averages". Weatherbase. Retrieved 11 January 2015. ^ "Drought, cyclone then snow for Chathams farms". 25 August 2015. ^ "Climate Data and Activities". NIWA Science. 27 February 2007. Retrieved 15 October 2013. ^ Adams, C J; et al. (1979). "Age and correlation of volcanic rocks of Campbell Island and Metamorphic basement of the Campbell Plateau, South-west Pacific". New Zealand Journal of Geology and Geophysics. 22 (6): 679–691. doi:10.1080/00288306.1979.10424176. ^ Hoernle, K.; White, J.D.L. ; Van Den Bogaard, P.; Hauff, F.; Coombs, D.S. ; Werner, R.; Timm, C.; Garbe-Schönberg, D.; Reay, A.; Cooper, A.F. (15 August 2006). "Cenozoic intraplate volcanism on New Zealand: Upwelling induced by lithospheric removal". Earth and Planetary Science Letters. 248 (1–2): 350–367. doi:10.1016/j.epsl.2006.06.001. ISSN 0012-821X. ^ Richards, Rhys. "Chatham Islands - Overview". Te Ara - the Encyclopedia of New Zealand. Retrieved 29 December 2016. ^ "Chatham Shag (Phalacrocorax onslowi) - BirdLife species factsheet". Birdlife.org. Retrieved 27 August 2015. ^ "Pitt Shag (Phalacrocorax featherstoni) - BirdLife species factsheet". Birdlife.org. Retrieved 27 August 2015. ^ "Chatham Albatross (Thalassarche eremita) - BirdLife species factsheet". Birdlife.org. 2 December 2010. Retrieved 27 August 2015. ^ Rowe, S (August 2010). "Level 1 Risk Assessment for Incidental Seabird Mortality Associated with New Zealand Fisheries in the NZ-EEZ" (PDF). ^ "Seabirds Recorded at the Chatham Islands, 1960 to May 1993" (PDF). Notornis.osnz.org.nz. Retrieved 27 August 2015. ^ Jolly, Dyanna (2014). Cultural Impact Assessment Report (PDF). Chatham Rock Phosphate. p. 10. Archived from the original (PDF) on 2 February 2016. Retrieved 14 March 2016. Chisholm, Hugh, ed. (1911). "Chatham Islands" . Encyclopædia Britannica. 6 (11th ed.). Cambridge University Press. pp. 6–7. ^ a b King, M. (2004). Being Pakeha. Penguin. p 196. ^ a b McNab, Robert (1913). "XIX. — American Whalers and Scientists, 1838 to 1840". The Old Whaling Days. Victoria University of Wellington. Retrieved 2 December 2018. ^ McNab, Robert (1913). "XV. — The French Fleet, 1836 to 1838". The Old Whaling Days. Victoria University of Wellington. Retrieved 3 December 2018. ^ Patricia Burns (1989). Fatal Success: A History of the New Zealand Company. Heinemann Reed. pp. 243, 244. ISBN 978-0-7900-0011-4. ^ Rykers, Ellen (July – August 2018). "The lie of the land". New Zealand Geographic. 152: 92–103. ^ "German Missions". Reference Guides - Missionary Sources (PDF). Hocken Collections. 2008. p. 10. Archived from the original (PDF) on 19 December 2008. Retrieved 9 December 2008. ^ a b Richards, Rhys (4 May 2015). "Chatham Islands – Since the 1980s". Te Ara – the Encyclopedia of New Zealand. Retrieved 5 January 2019. ^ Richards, Rhys (4 May 2015). "Chatham Islands – Chatham Islands from the 1860s to the 1980s". Te Ara – the Encyclopedia of New Zealand. Retrieved 5 January 2019. ^ Richards, Rhys (4 May 2015). "Chatham Islands - Since the 1980s'". Te Ara - the Encyclopedia of New Zealand. Retrieved 28 February 2019. ^ "1996 Census of Population and Dwellings – Census Night Population". Statistics New Zealand. 28 February 1997. Archived from the original on 13 February 2016. Retrieved 17 May 2016. ^ "Getting to the Chatham Island". Discoverthechathamislands.co.nz. Archived from the original on 25 September 2015. Retrieved 2015-08-27. ^ a b "Chatham Islands Shipping Ltd". Retrieved 27 August 2015. ^ www.seawings.co.uk, flying boat forum. "Short flying boats in New Zealand". Retrieved 3 June 2013. ^ Blakiston, Fergus (29 August 2015). "The good ship Rangatira". The Timaru Herald. Retrieved 28 October 2015. ^ "Your Council » Chatham Islands Council". ^ Stewart, Ashleigh (25 July 2015). "Ministry of Health 'concerned about financial performance' of CDHB". The Press. As of July 1, control of the Chatham Islands' health services will transfer to Canterbury. ^ "Contact Us". Airchathams.co.nz. Archived from the original on 9 September 2015. Retrieved 27 August 2015. ^ "Chatham Islands Wind Farm". New Zealand Wind Energy Association. Retrieved 4 January 2017. King, Michael (1989). Moriori: A People Rediscovered (2000 ed.). Viking. ISBN 978-0-14-010391-5. McFadgen, B. G. (March 1994). "Archaeology and Holocene sand dune stratigraphy on Chatham Island". Journal of the Royal Society of New Zealand. 24 (1): 17–44. doi:10.1080/03014223.1994.9517454. Harper, Paul (15 October 2010). "Voter turnout up in local elections". The New Zealand Herald. Retrieved 16 October 2010. 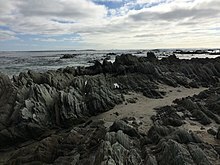 Wikivoyage has a travel guide for Chatham Islands. Wikimedia Commons has media related to Chatham Islands.